The Trey McIntyre Project, an Idaho-based dance troupe, is choreographing a novel way to manage a leading-edge arts organization. Running a dance company today is a risky proposition. According to a study by Dance/USA, a national organization that serves the dance profession, US dance companies lost nearly 10 percent of their audience between 2007 and 2011. But TMP has seen its audience numbers grow over the past half decade. Indeed, to accommodate interest among Boise residents, the organization recently added an extra matinee performance to its schedule. A close connection has formed between TMP and its off-the-beaten-path hometown. That link to Boise has proved to be a vital asset for the company. It’s one reason why funders, presenters, and nonprofit thought leaders believe that TMP is reinventing what it means to be an arts organization in the 21st century. TMP maintains a rigorous touring schedule that lasts up to 30 weeks per year. In 2012, the company toured China, South Korea, the Philippines, and Vietnam as part of a cultural exchange program sponsored by the US State Department. It also enjoys high-profile relationships with presenter groups such as the Brooklyn Academy of Music in New York City and Cal Performances in Berkeley, Calif. Even so, the company has firmly cemented its ties to the Boise area by mounting two full-scale dance productions in the area each year and by conducting a variety of community engagement initiatives in collaboration with schools, businesses, hospitals, and other local institutions. What drew McIntyre and his fellow pioneers to Boise were the beauty of the surrounding landscape, the low cost of living, and the positive reactions that they had received during previous touring engagements in the city. From the start, McIntyre and his entourage made their presence felt in their new community. They playfully announced their arrival by offering a series of spontaneous urban dance performances, or “SpUrbans”: Wearing street clothes and sneakers, TMP dancers descended on public spaces around town—a sidewalk in Boise, a parking lot at Boise State University—and offered brief, lively displays of their work. Both at home in Boise and on the road, TMP focuses on balancing high-quality public dance performances with community engagement efforts. The company’s Make a Ballet program, for example, provides audiences with an intimate view of the rehearsal process. That program began as an exclusive perk for big donors, but it has morphed into an offering that’s available to wider audiences. To demystify the dance process, TMP dancers also work with school groups, they shoot rehearsal videos that they publish on social media channels, and they encourage passersby to join them in SpUrban events that they initiate in the cities they visit. “They have a commitment to what happens beyond the stage,” says Matias Tarnopolsky, director of Cal Performances. In 2010, McIntyre was commissioned to create a ballet for the Jaialdi International Basque Cultural Festival, an event held in Boise every five years. (Idaho boasts the largest Basque community in the United States today.) To help him create the ballet, which he called Arrantza, McIntyre invited local Basque dancers into his studio to enrich his company’s understanding of Basque folk dance. For the soundtrack to the ballet, he recorded traditional Basque instrumental music and oral histories by people of Basque heritage. Once the new ballet was complete, TMP partnered with Boise’s Basque Museum and Cultural Center to produce a preview event that featured Basque food, live performance excerpts from Arrantza, and a Q&A session with TMP dancers. The organization also incorporated the new ballet into its ongoing engagement activities with local schools, tying the work in with the students’ academic study of Basque culture. “It’s wonderful that the Trey McIntyre Project has researched what makes their adopted city unique and has incorporated it into their dance program,” says Barbara Oldenburg, a teacher at the Lake Hazel Middle School in Boise. TMP’s approach to audience engagement is integral to its way of doing business. In some ways—with its spirit of experimentation, its adoption of new technologies, and its focus on branding—the organization more closely resembles a Silicon Valley startup than it does a traditional dance company. Consider the company’s High 5 campaign, which aims to strengthen TMP’s base of support by reaching out to fans at a grassroots level. McIntyre, who has a passion for making dance films, created a short, lighthearted documentary to launch the effort. People throughout the company are using Facebook and other social media tools to spread the word about High 5. 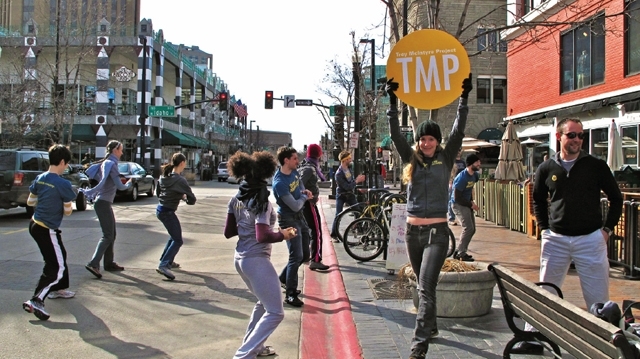 And the TMP website advertises the initiative with a visually striking image that shows two dancers in jeans, sneakers, and TMP-branded T-shirts. In the image, the dancers are leaping in the air and high-fiving each other against an azure sky. So far, the campaign has helped TMP raise more than $6,000 in small donations. But High 5 isn’t just about raising funds. “We’re looking for more than monetary support. We’re looking for ambassadors,” says Brian Aune, chief operating officer and general counsel at TMP. Since 2008, TMP has seen its annual revenues increase from more than $1.6 million to close to $2.5 million. It raises one-third of its funding from individual contributions, one-third from government and corporate grants, and one-third from earned income. One source of earned income, for example, comes from running corporate workshops—a branch of the business that TMP leaders hope to expand. TMP also recently received a $50,000 grant from the Paul G. Allen Foundation to develop its capacity to market and license McIntyre’s choreographic work to other dance institutions. Among the companies that have expressed an interest in staging McIntyre’s work are Washington Ballet, Pennsylvania Ballet, and Queensland Ballet.